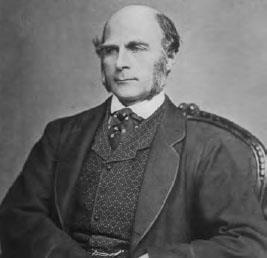 What were the contributions of Francis Galton? In his search to prove the heritability of intelligence, he made several astounding methodological innovations that are still in wide use today. These included the statistical technique of correlation (a mathematical test to see how much two traits increase or decrease together), the comparison of identical and fraternal twins, the use of self-report questionnaires and word association tests, the phrase “nature and nurture” and the concept of “regression towards the mean.” This last idea derives from Galton’s observation that when measurements are repeated over time, the extreme values tend to move toward the middle. For example, very tall parents will often have less tall children. His less illustrious contribution was the field of eugenics.